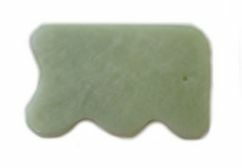 This Gua Sha scraping tool is made from Jade. Features rounded and contoured sides to perform treatment on curved areas of the body. Jade is cooler to the touch than bulls horn boards. Good when you need to balance yin (cold) with yang (heat).